Snowmass Colorado is a destination for travelers looking for adventure! Whatever the season, Snowmass Resort is always bustling with activities, boasting over 3,000 skiable acres, loads of kids and family pursuits and lodging to suit any budget. Snowmass Colorado has become a popular haven for groups, families and adventure seekers alike. We have a fantastic selection of Snowmass condos to choose from, for your upcoming Snowmass vacation with seasonal Aspen deals that can save you up to 35% OFF! During winter months, skiers relish the varied terrain at Snowmass Mountain. Regardless of ability, Snowmass Resort provides exceptional skiing and riding for every level. Need to brush up on your skills? No problem! Our vacation planning specialists can arrange ski or snowboard lessons for you. You’ll be carving up the slopes in no time! Summertime brings along a entirely different set of experiences for the mountain and outdoor enthusiast. Snowmass Resort in Colorado treats visitors to some of the best hiking, biking and summer events in the entire Rocky Mountain region. A variety of summer fun takes place each year and varies from the ever-popular Colorado Wanderlust Festival to the free music series that occurs throughout the summer. Whatever the season, there is no lack of things to keep even the most active of guests busy at Snowmass Resort! Snowmass Vacations looks forward to welcoming you to Snowmass where adventure has no season. 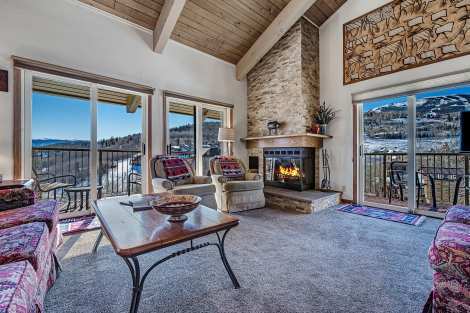 This homey Woodbridge Mountain Condo in Snowmass has all you could ever need in the ideal mountain vacation home, while being conveniently located five minutes from the base of Snowmass Mountain via a free shuttle service. The master bedroom has a King bed with a private bathroom and a 32 inch flat screen TV. The guest bedroom has 2 Twin beds and a private bathroom. Guests may enjoy a fully equipped kitchen with a table that seats 6 people, and guests may enjoy the modern warmth of a gas fireplace. There is a summertime community pool, year round hot tub, and complex laundry facility on-site for the convenience of guests. 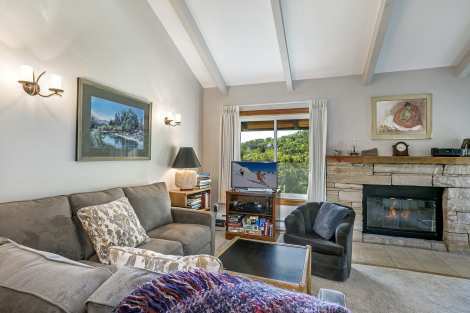 This homey Woodbridge Mountain Condo in Snowmass is located on the second floor and has all you could ever need in the ideal mountain vacation home, while being conveniently located five minutes from the base of Snowmass Mountain via a free shuttle service. This is a 2-story unit with lofted ceilings. The dining table provides seating for 6, while the kitchen boasts granite counter tops & is fully equipped. The master bedroom has a Queen bed with a private bathroom, flat screen TV, and a private deck. The guest bedroom has 2 Twin beds and a private bathroom. Guests may also enjoy a pullout couch in front of the brick framed fireplace, as well as an outdoor deck with a grill for barbecuing. There is a summertime community pool, year round hot tub, and complex laundry facility on-site for the convenience of guests. 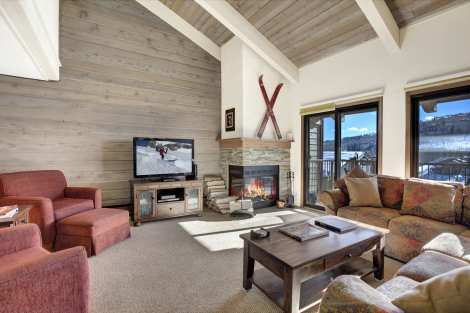 Relax and unwind after a day of Snowmass Mountain fun in this stylishly remodeled Woodbridge Condominium. Situated on the second level, guest will be welcomed with bright, stunning mountain views from the moment they walk in the door. 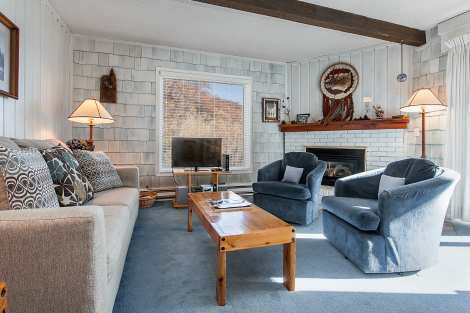 With two bedrooms, two full bathrooms and bedding to accommodate up to six comfortably, this condo is an ideal home base for families or groups of adventure loving friends. 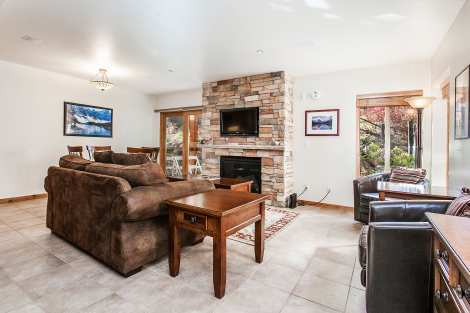 Complete with all the comforts of home including a fully stocked and upgraded kitchen, cozy fireplace, private deck with mountain views and BBQ, soft leather furnishings and flat screen TVs, travelers will have everything they need for a fun and relaxing mountain getaway. Sit on the deck each morning and enjoy your coffee while soaking in the breathtaking mountains then walk out the front door, jump on the free skier shuttle and be whisked away to your next adventure. Guests will also love the abundance of onsite amenities including a common area hot tub and heated pool, laundry facilities, and onsite parking. The location and comfort of this unit combine to make it an easy and idyllic choice for your next vacation. 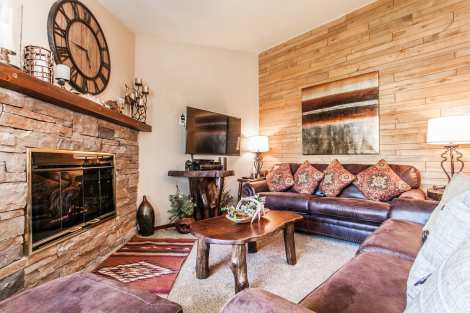 This homey Woodbridge Mountain Condo is located on the ground floor and has all you could ever need in the ideal mountain vacation home, while being conveniently located five minutes from the base of Snowmass Mountain via a free shuttle service. The master bedroom boasts a King bed with a private bathroom and a 24 inch flat screen TV. The guest bedroom has 1 Queen bed and 1 Twin bed while including a private bathroom. Guests may enjoy a newly refurbished kitchen with granite counter tops and stainless steel appliances in addition to 4 counter top chairs. Guests may also enjoy a pullout sleeper sofa and gas fire place in the living room, and there is a grill on the deck for evening barbecues. There is a summertime community pool, year round hot tub, and complex laundry facility on-sit for the convenience of guests. 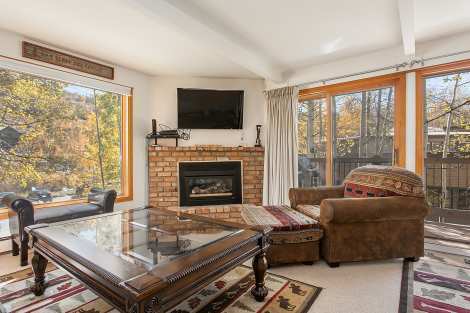 Two bedrooms plus a loft allows for ample room to sleep five guests in this nicely appointed Woodbridge Condominium in Snowmass Village. Guests are welcomed by a warm, southwest inspired living area that includes a brick fireplace – the ideal spot to curl up and relax on a chilly Snowmass night. The adjacent bright and sunny kitchen is nicely appointed and has room for four to dine at the table with additional room at the breakfast bar. The master boasts a king bed, and the guest room offers two twin beds with an additional double mattress in the loft. Each window offers mountain vistas, and a balcony with grill allows guests to enjoy a BBQ should they choose to spend a night cooking in. The summertime common area pool and year round hot tub are the perfect spot to meet new friends after a day of adventure, or just unwind and relax with friends and family. 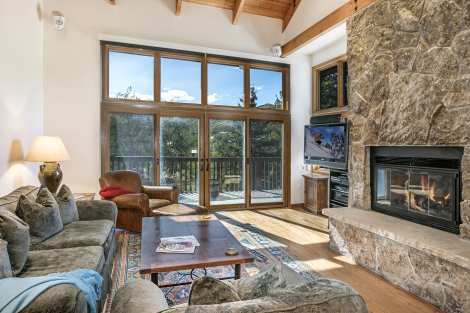 This two bedroom, two bath Woodbridge Condominium in Snowmass is about a 5-minute free shuttle ride to Snowmass Mountain. 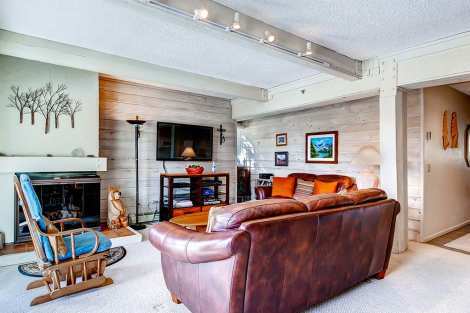 This contemporary condo has wonderful views and features two large comfortable leather sofas and extra seating along with a 32 inch flat screen TV and a gas fireplace for an evening of relaxation or entertainment. The dining area has room for 4, and the island bar has seating for 4. The master bedroom has a King bed, and the guest bedroom has a Twin bed with a trundle and a Twin bunk bed. 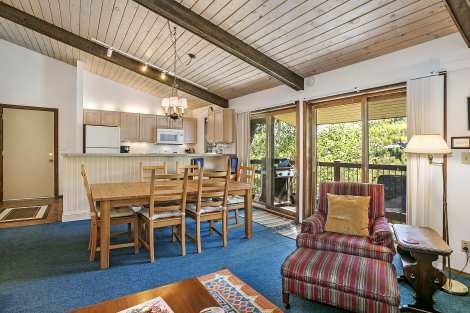 Enjoy the mountain air while sitting on the balcony that also offers a grill for barbecuing. A summertime common area pool and year round hot tub offer a delightful escape from your day of skiing, hiking or mountain biking. 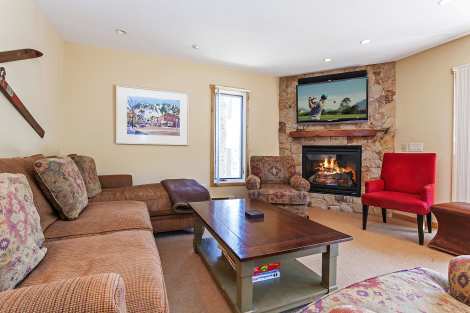 This two bedroom, two bath Woodbridge Condo in Snowmass Village is just a 5-minute free shuttle ride to Snowmass Mountain. 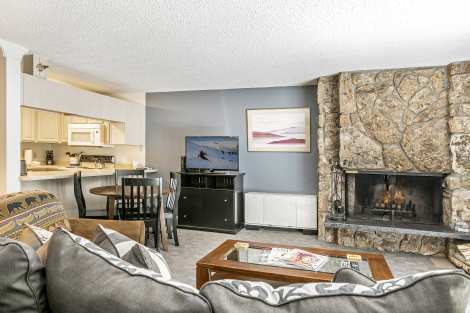 This contemporary condominium has wonderful views of the surrounding mountains and includes two large comfortable leather couches with a flat screen TV and gas fireplace for an evening of relaxation or entertainment. The dining room seats 6, and the bar provides seating for 4 more. The master bedroom offers a King bed, and the guest bedroom has an additional King bed or twins if you prefer an extra bed. 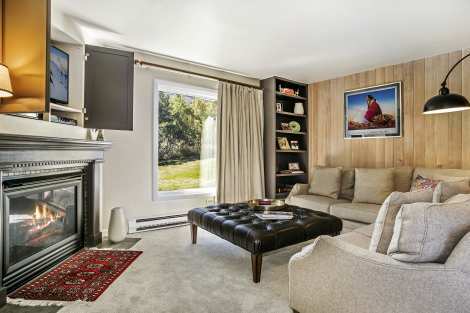 There is also a sleeper sofa in the living room for extra guests. 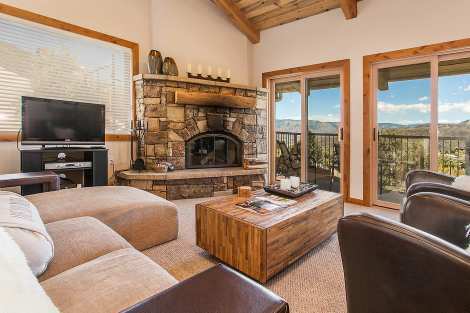 Enjoy the mountain air while sitting on the patio that also offers a grill for barbecuing. A summertime common area pool and year round hot tub offer a delightful respite after your day of skiing, hiking or mountain biking. 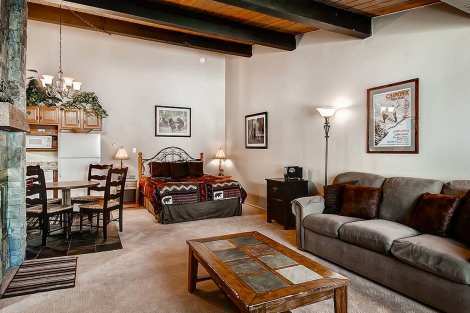 This homey Woodbridge Mountain Condo is located on the top floor, and has all you could ever need in the ideal mountain vacation home while being conveniently located five minutes from the base of Snowmass Mountain via a free shuttle service. The master bedroom boasts a King bed with a private bathroom and a 32 inch flat screen TV. The guest bedroom has 2 Twin beds and a 32 inch flat screen TV, and there are an additional 2 Twin beds in the loft that is ideal for children. Guests may enjoy a kitchen with granite counter tops, custom cabinets, and stainless steel appliances. Dining table seating for 6, and bar seating for 4, provided ample room to entertain family and friends. Guests may also enjoy an outdoor deck that includes seating for 2, and a grill for evening barbecues. There is a summertime community pool, year round hot tub, and a complex laundry facility on-site. 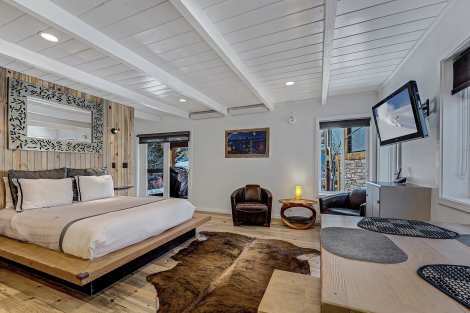 This contemporary meets mountain studio includes a queen bed and twin bunks plus kitchenette. 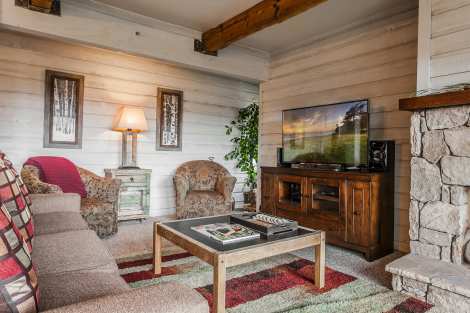 The studio is thoughtfully decorated and designed for the travelers looking to spend more time skiing, hiking and mountain biking. The cozy dining area is the perfect spot for two or a close family of four. This condo even has a washer and dryer!! A common area pool and hot tub can be found only steps away and access to the Mall and Base Village are just a short walk. This is the perfect little retreat in the mountains. 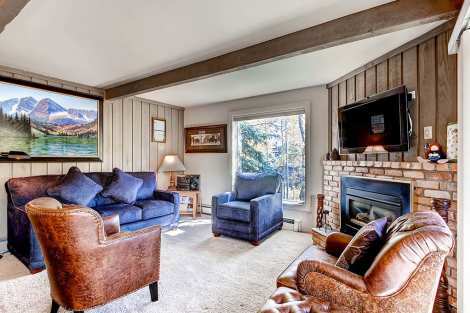 This homey Woodbridge Condo rental is located on the second floor and has all you could ever need in the ideal mountain vacation home, while being conveniently located minutes from the base of Snowmass Mountain via a free shuttle service. The master bedroom boasts a King bed with a private bathroom, the guest bedroom has a Queen bed with a private bathroom, and there is an additional loft with 2 Twin beds. Guests may enjoy a dining room table that seats 4, and a bar which seats an additional 2. 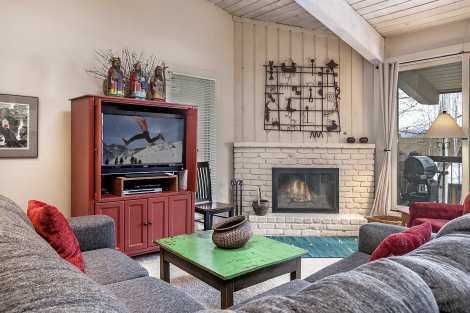 The living room features a cozy wood burning fire place to relax by after a long day of skiing. Enjoy your morning coffee on the large outdoor deck that features comfortable patio furniture, and a barbeque grill. Amenities include the summertime community pool, a year round hot tub, and complex laundry facility on-site for the convenience of guests. 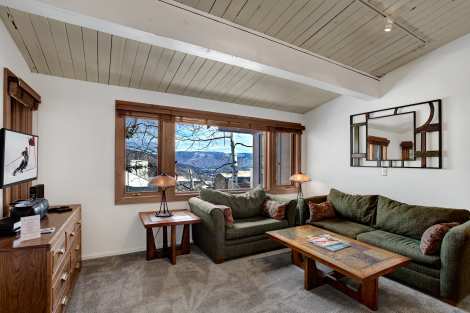 This beautifully remodeled two-bedroom, two bath condo boasts a modern elegance, it's located a mere 50 yards from Snowmass ski slopes and is conveniently located near the free shuttle. 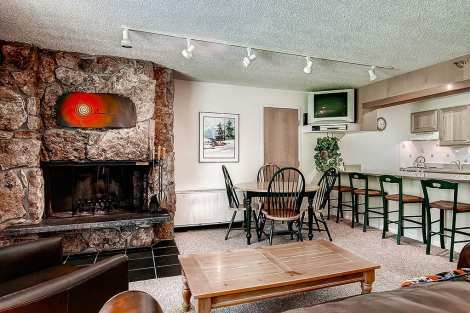 Condo includes a sleeper sofa, a 42-inch flat screen TV in the living room, and a gas fireplace. The dining room table sits 6 people and there are 2 additional counter stools. Guests may enjoy an upgraded kitchen with stainless steel appliances and a granite counter top, and there is a guest hall bathroom that includes a shower and bathtub. The master bedroom has a King bed and a private bathroom. The guest bedroom has a split King bed and a 32-inch flat screen TV. The Terracehouse condos offer additional comfort with heated walkways and an outdoor hot tub. Guests may also enjoy ample storage space in the entry way for skis and other personal items. This unit is located on the second floor, and a washer and dryer are in the master bedroom for your convenience. 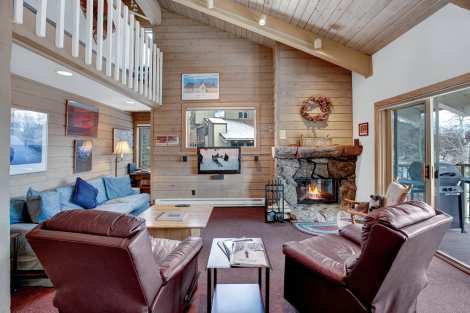 This two bedroom, two bath Woodbridge Condo is just a short walk or shuttle ride to Snowmass Mountain, The Center, Base Village and the Snowmass Mall. 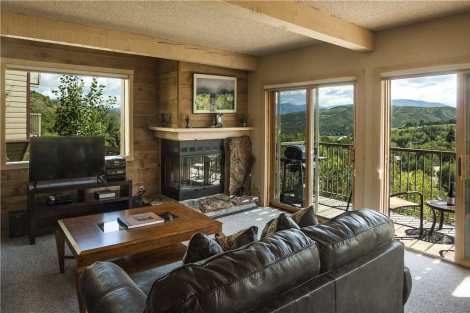 This contemporary condo has wonderful views of the surrounding mountains and includes a living room with two large comfortable leather couches and a flat screen TV, as well as a gas fireplace for an evening of relaxation or entertainment. The master bedroom offers a king bed, and the guest bedroom has a queen bed. A fun loft includes three twin beds for extra sleeping space. 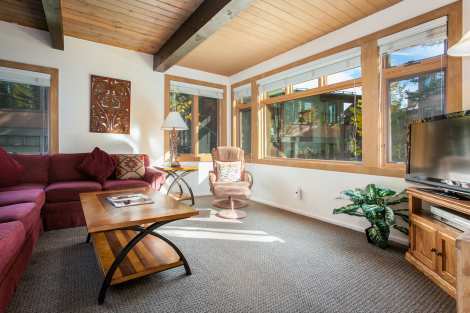 Enjoy the fresh mountain air while sitting on the patio that also offers a grill for barbecuing. A summertime common area pool and year round hot tub offer a delightful respite after your long day of skiing, hiking or mountain biking. 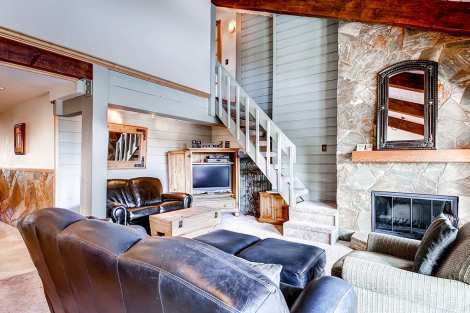 Rustic elegance makes this three-bedroom, two story condo the ultimate Rocky Mountain getaway. Thoughtful touches throughout ensure all the comforts of home. Cathedral style ceilings, floor to ceiling windows with spectacular views and beautiful décor set the tone for this charming condo. 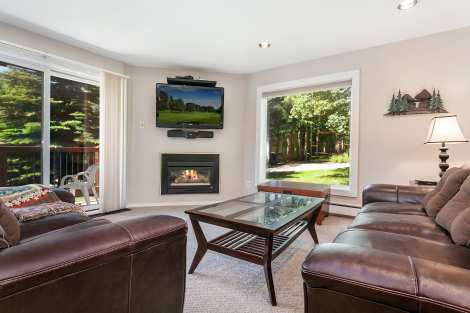 Cozy up to the stone wood burning fireplace while watching a movie on the flat screen tv. The well-appointed kitchen with custom cabinets, granite counter tops and new appliances is a chef’s dream. The antler chandelier above the glass dining table make an ideal spot to share dinner with family and friends. The entryway to the master upstairs has a sofa sleeper, which also has a private patio attached. The guest room has a Queen, with en suite bath. The third has a room perfect for kids, with a Double bed and lofted Twin. An outdoor balcony has outstanding mountain views and a grill to enjoy an afternoon or evening barbecue. The Snowmass Mountain Condos are conveniently located across from the shuttle that takes guests to the Snowmass ski lifts within five minutes. There is also a washer and dryer included in this unit.ONE guaranteed parking space, which can fit 2 small to medium sized cars or 1 large vehicle. 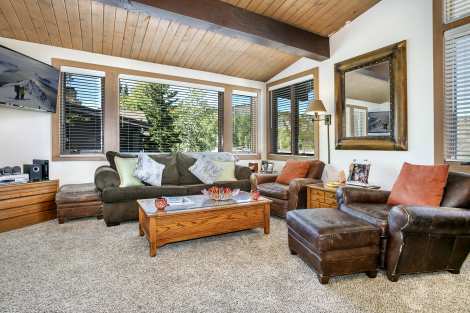 A desirable location in Snowmass Village, this cozy Woodbridge condominium sleeps up to four, and also provides a fully equipped kitchen with granite counter tops, and updated custom cabinets. 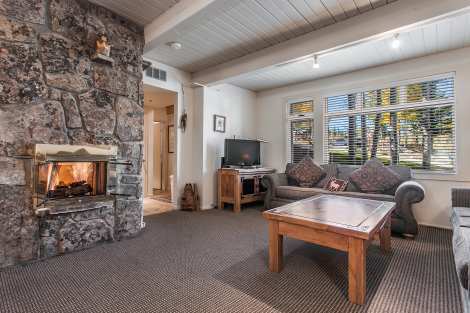 Ample living room seating, with a very large flat screen TV and a gas fireplace for evenings spent relaxing after a long day of adventures in Snowmass. Dining room seating seats 4. 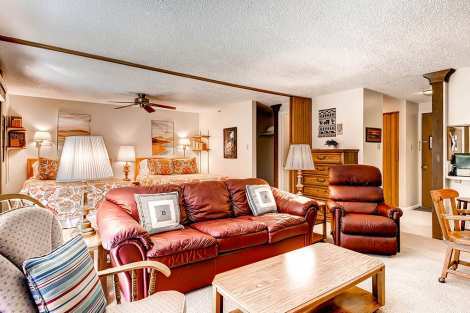 Access to the summertime common area pool and year round hot tub is also included in this rental unit. Balcony includes a grill for whipping up meals for guests and family, and there is a laundry facility located on-site for your convenience. 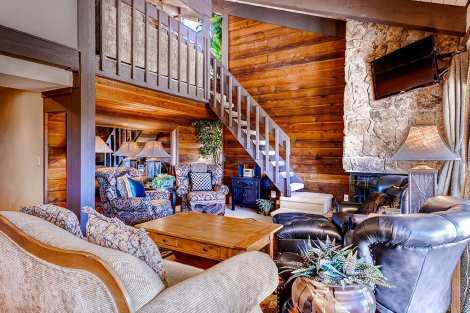 This cozy mountain retreat offers two-bedrooms with a large living area and two full baths spaciously accommodating 4 guests. 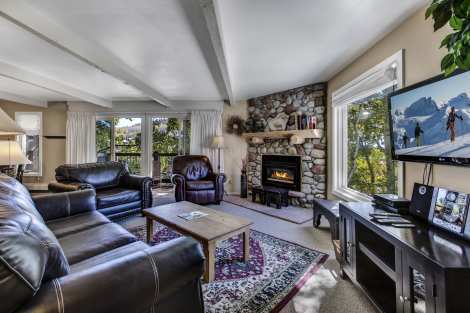 The living area boasts plush leather furniture, 50-inch flat screen tv, gas fire place with a balcony providing beautiful Rocky Mountain views and gas BBQ grill. The fully stocked kitchen flows into the dining room with ample seating. The condo includes a washer and dryer in the unit and 1 covered parking space. 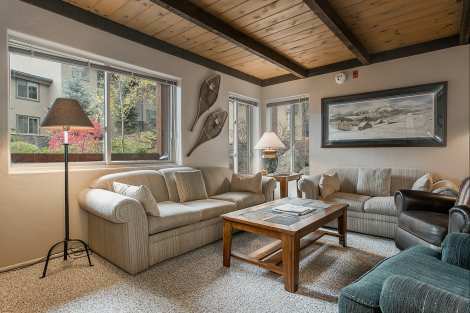 Escape to the mountains, call and book today! 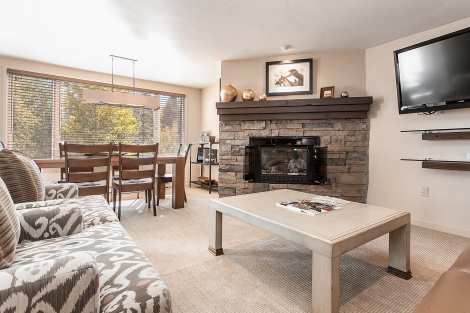 This gorgeous two bedroom, two bath Woodbridge Condo is about a 5-minute free shuttle ride to the Center, Base Village and the Snowmass Mall. 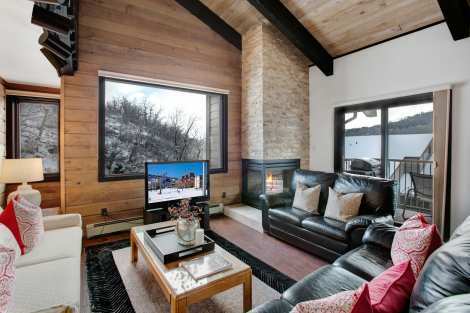 This contemporary condo in Snowmass has wonderful views of the surrounding mountains and includes a comfortable living area with a flat screen TV and gas fireplace for an evening of relaxation or entertainment. The kitchen has been beautifully upgraded, with custom cabinets, a custom fridge and freezer, granite counter tops and new appliances. The master bedroom offers a King bed, and the guest bedroom has two twin beds. 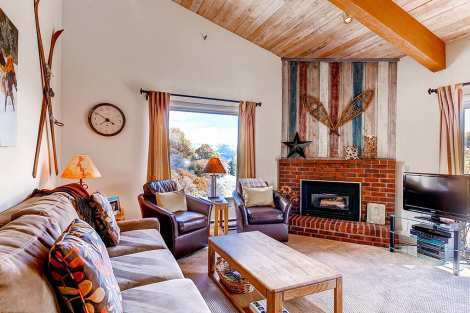 Enjoy the mountain air while sitting on the patio that also offers a grill for barbecuing. A summertime common area pool and year round hot tub offer a delightful respite after your day of skiing, hiking or mountain biking. 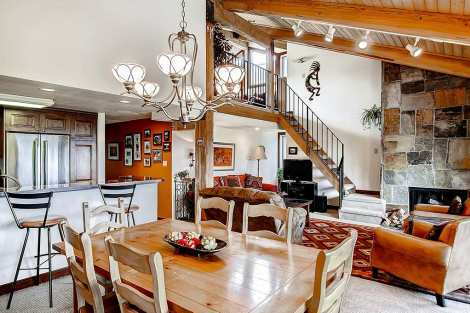 This condo is the perfect combination of rustic and modern with space for eight. Cathedral ceilings, stone wood burning fireplace and wood beams are just a few of the stand out details that guests will fall in love with. This three-bedrooms three-bath condo boasts incredibly spacious living spaces-- including 2 sets of twin bunk beds in the lofted bedroom. The downstairs windows offer panoramic views of the surrounding valley, and there is an outdoor patio with a grill for preparing barbecues. Guests may also enjoy the granite counter tops in the kitchen that offer four bar stools which provides more seating in addition to the condo's six-person dining table. A washer and dryer are included in the unit for your convenience. While staying at the Snowmass Mountain Condos guests can enjoy amenities such as an assigned covered parking spot, a common area pool and hot tub as well as the convenience of being directly on the shuttle route and only a mile from the base of the Snowmass Resort.ONE guaranteed parking space, which can fit 2 small to medium sized cars or 1 large vehicle. 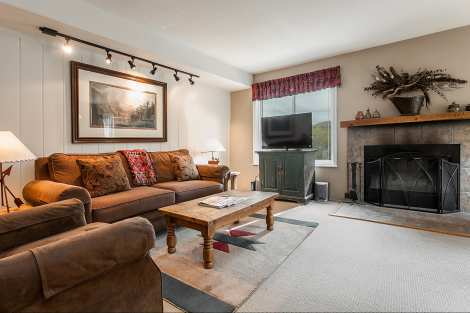 This two bedroom, two bath condo is located a mere 50 yards from the Snowmass ski slopes and is conveniently located near the free shuttle. 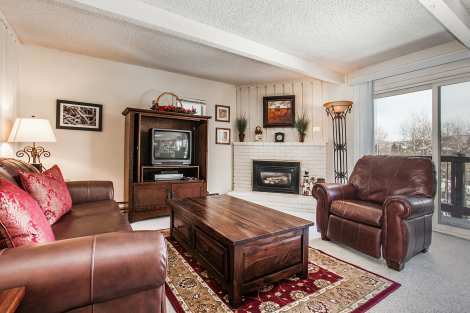 This condo includes a sleeper sofa, a gas fireplace, and mountain views. Guests may enjoy an upgraded kitchen with stainless steel appliances. The master bedroom has 2 Double beds and a 42 inch flat screen TV. The guest bedroom has 2 Double beds and a 36 inch flat screen TV. The Terracehouse condos offer additional comfort with heated walkways and a community hot tub, and renters have access to the Stonebridge heated pool. This unit is located on the top floor, and it is located closest to the pool and outdoor community barbecue. Set the tone of your Rocky Mountain vacation with this rustic charmer. This condo has all the elements needed for ultimate relaxation. Enjoy the comforts of two living spaces both of which include flat screen TV's and private balconies. Sip coffee and soak in the mountain views from one of the two balconies or throw something delicious on the propane BBQ grill. Two of the three bedrooms are Queen master suites. The third bedroom offers bunk beds that are perfect for the kids. This condo boasts a modern kitchen with stainless steel appliances, beautiful granite counter tops and tile floors. Gather at the 6-person dining table for a nice dinner shared with friends and family. 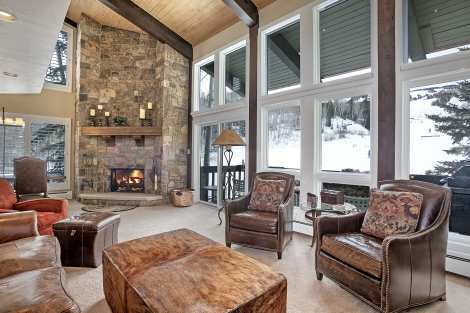 After dinner cozy up to the jaw dropping wood burning fireplace with floor to ceiling stonework. Beauty and practicality combine with the additional perks of having a washer and dryer located in the condo. 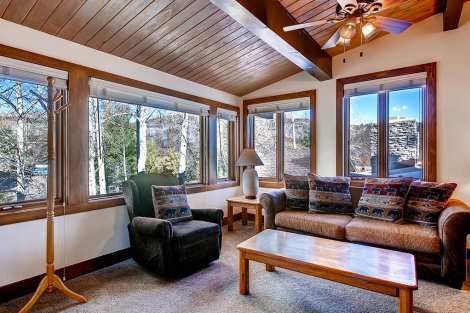 Snowmass Mountain Condominiums offers a common area hot tub, outdoor heated pool and sauna. Conveniently located about a mile from the Snowmass base village and with a shuttle stop just outside your door makes getting around a breeze! One guaranteed parking space, which can fit 2 small to medium cars or 1 large vehicle is included with this property. 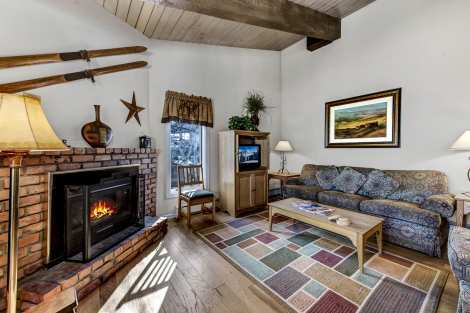 Rocky Mountain charm combine with convenience for an ultimate mountain getaway. Don’t wait, book today! This two bedroom, two bath Woodbridge Condo is about a 5-minute free shuttle ride to the Center, Base Village and the Snowmass Mall. 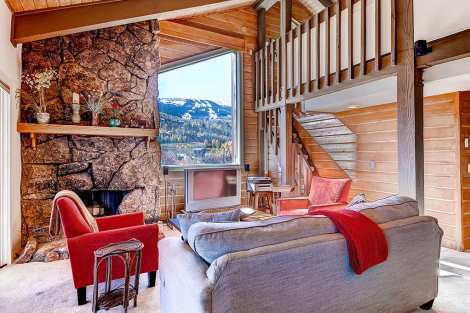 This contemporary Snowmass condo has wonderful views of the surrounding mountains and includes comfortable leather seating with a flat screen TV and gas fireplace for an evening of relaxation or entertainment. The master bedroom offers a King bed, and the guest bedroom has two Twin beds. There is an additional sleeper sofa for extra comfort. 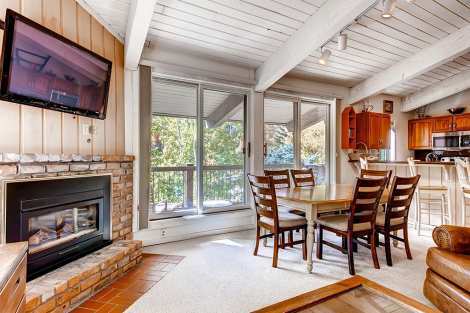 Enjoy the mountain air while sitting on the patio that also offers a grill for barbecuing. A summertime common area pool and year round hot tub offer a delightful respite after your day of skiing, hiking or mountain biking. A laundry facility is located in the complex for your convenience.